Have been considering doing some remodeling in your precious St. Louis property? We all know that investing in home improvement can be a very expensive mission that can saddle your finances. Of course you can always resort to hiring a professional and leave all the nitty-gritty work to their expert h ands. But with a lot of contractors claiming they’re the best, it can leave you stumped for not knowing exactly who is telling the truth. Likewise, you need to be sure that you can trust that company, especially if you plan to work on a part of your home as important as your entry doors in St. Louis MO. Your trust issues are utterly underst andable because there is no certain way of knowing the reliability and capacity a contractor to deliver the job well. Yes, here’s why the Better Business Bureau (BBB) is your knight in shining armor. This is one the best ways to determine if you can rely on a contractor to take care of that investment for you. 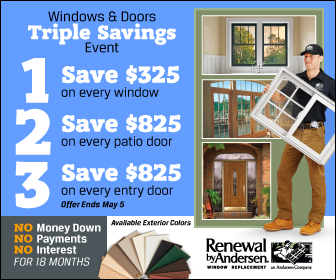 And while you’re browsing the BBB website for information, you might as well check the page of Renewal by Andersen®: renewalbyandersen.com. To know more about us, the exclusive retailer in St Louis, go to: rbastl.com/about-us/. Established a positive track record in the marketplace. Established proper standards in our advertisements. Honestly represented our products and services in a clear and concise manner, including the terms. Openly disclosed the nature, location and ownership of our business and clearly discussed our policies, guarantees and procedures that require the customer’s decision to buy. Ensured that integrity is part of all our business transactions. We are proud to say that we have gone to great lengths to achieve the highest rating and certainly we can safely say that you can put your trust on us to perform your next home improvement project. If you want to give your exterior a stylish facelift with St. Louis French Doors or install a durable window replacement, you know we can provide quality products with the proper warranties and installation. Trust Renewal by Andersen of St. Louis to work on your home, because apart from the outst anding BBB rating, the trust given to us by our satisfied clients proves that we do excellent work. Feel free to contact us today.